Lunar ephemeris data is used to find all the times when the Perigee of the lunar orbit points directly at, or away, from the Sun, at times when the Earth is located at one of the cardinal points of its seasonal calendar (i.e., the summer solstice, winter solstices, spring equinox or autumnal equinox). All of the close lunar alignments are identified over a 536-year period between January 1st 1993 A.D. 00:00 hrs UT and December 31st 2528 A.D 00:00 hrs UT. A simple extension of this pattern gives additional precise alignments at periods of: 236.75, 296.50, 356.25, 416.0, 444.75 and 504.5 years. The full significance of the 208-year repetition pattern in the periodicities of lunar alignment index (ϕ) only becomes apparent when these periodicities are compared to those observed in the spectra for two proxy time series. 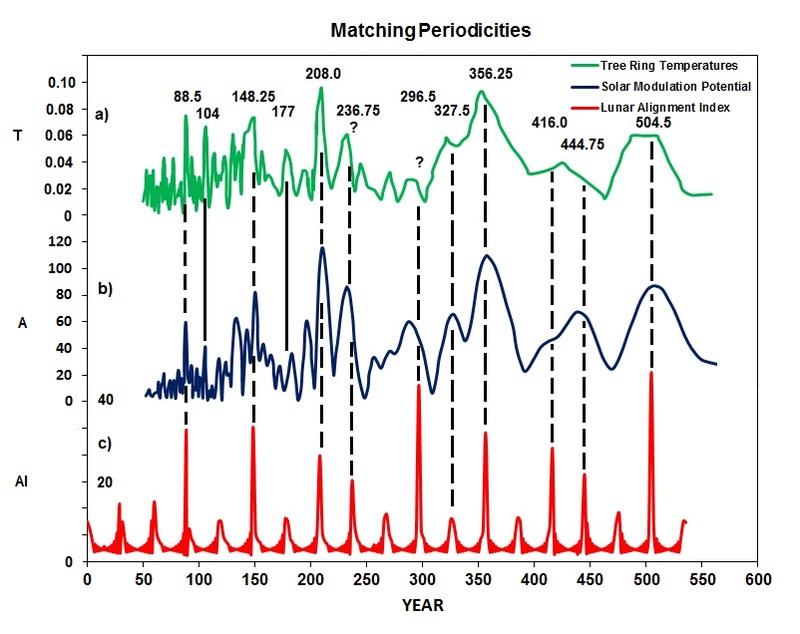 The first is the amplitude spectrum of the maximum daytime temperatures (Tm ) on the Southern Colorado Plateau for a 2,264-year period from 266 BC to 1997 AD. Tm is believed to be a proxy for how warm it gets during the daytime in any given year i.e., it is an indicator of annual mean maximum daytime temperature. Tm is derived from the tree ring widths of Bristlecone Pines (P. aristata) located near the upper tree-line of the San Francisco Peaks (= 3,536 m). The second is the Fourier spectrum of the solar modulation potential (ϕm) for the last 9400 years. ϕm is a proxy for the ability of the Sun’s magnetic field to deflect cosmic rays, and as such, it is a good indicator of the overall level of solar activity. It is derived from production rates of the cosmogenic radionuclides 10Be and 14C. When a comparison is made between these three spectra it shows that, of the nine most prominent periods seen in the lunar alignment index, eight have closely matching peaks in the spectrum of solar modulation potential (ϕm), and seven have closely matching peaks in the spectrum of the maximum daytime temperatures (Tm). The fact that the so many of the most prominent peaks that are seen in the lunar alignment index spectrum closely match those seen in the spectra of ϕm and Tm, strongly supports the contention that all three of these phenomena are closely related to one another. The critical piece of observational evidence that explains why Tm might be related to ϕm is provided . These authors find that there is a good correlation between the de-trended GCR flux and the semiannual component of the Earth’s LOD. Our analysis confirms the correlation found  and shows that the correlation is causal, with the changes in the GCR flux preceding those seen in the semi-annual component of the Earth’s LOD by roughly one year. This result leads us to develop a heuristic luni-solar model in order to explain the connection between Tm and ϕm. Firstly, the model proposes that there must be some as yet unknown factor associated with the level of solar activity on the Sun (e.g. possibly the overall level GCR hitting the Earth) that is producing long-term systematic changes in the amount and/or type of regional cloud cover. Secondly, it proposes that the resulting changes in regional cloud cover lead to variations in the temperature differences between the tropics and the poles which, in turn, result in changes to the peak strength of the zonal tropical winds. Thirdly, the model proposes that it is the long-term changes in the amount and/or type of regional cloud cover, combined with the variations in the temperature differences between the tropics and the poles that lead to the long-term changes in the poleward energy and momentum flux. And finally, it proposes that it is this flux which governs the rate at which the Earth warms and cools, and hence, determines the long-term changes in the world mean temperature. 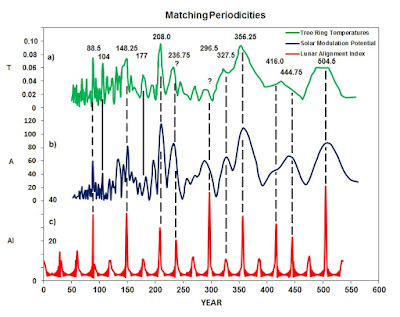 The close matches between the periods of the prominent peaks that are seen in spectra of ϕ Figure 4a and Tm Figure 4c, indicate that a factor associated with the times at which the Perigee of the lunar orbit points directly towards or directly away from the Sun, at times when the Earth is at one of its Solstices or Equinoxes, has an influence on the Earth’s mean temperature [N.B. these alignments take place in frame of reference that is fixed with respect to the Perihelion of the Earth’s orbit]. The proposed Luni-Solar Model suggests one possible mechanism that might explain the influence of ϕ upon Tm. This model proposes that the periodicities associated with the long-term alignments between the times when the Perigee of the lunar orbit points directly towards or directly away from the Sun (i.e., half multiples of the FMC) and the seasons (i.e., the Solstices and Equinoxes – which, by definition, are synchronized with annual and semi-annual variations in LOD), produce comparable periodicities in the zonal wind speeds of the Earth’s atmosphere. These wind speed changes, in turn, produce longterm periodicities in the Earth’s mean temperature through their influence upon the efficiency with which the Earth warms and cools. Finally, if we accept the hypothesis that planetary gravitational and tidal forces could influence the overall level of the Sun’s magnetic activity, then the observed synchronicity between ϕ and ϕm could be explained if these same planetary forces played a role in shaping the present-day orbit of the Moon. That was a ridiculous rant that Willis E made against you at WUWT. Remember that Willis is a nobody in the great scheme of things so keep on with this effort. Thanks @whut - Willis is from the old Occam's razor school of science that tries to understand the world in its simplest terms. For that, he is to be commended. However, he seems to be very insecure when it comes to mild criticisms of some of his underlying assumptions. I have tried to be supportive of his efforts and I go out of my to give him kudos whenever kudos is due. Hopefully one day he will settle down.